Dr Melissa Terras, Senior Lecturer in Electronic Communication in UCL Information Studies, not only runs a blog about her work - she also researches how blogs are used in academic life. She explains the fascination with this immediate, boundary-bending method of communicating. "If I am going to teach and research how web 2.0 technologies are used in the modern information environment, I feel that I really should be participating too. So two years ago I started my blog to write about my professional activities. Over this time I've built a dedicated readership and now use it as a channel for interacting with students and colleagues. "Maintaining a blog raises many issues though, regarding the type of information you want to be out there about your work, and where to draw the professional and personal boundary. It's a careful, considered space, but one I feel that I should be participating in. Realistically, how can I demonstrate and research these tools unless I'm prepared to play with them myself? "Along with my colleague Dr Claire Warwick, Director of the UCL Centre for Digital Humanities, I have recently secured funding from the Joint Information Systems Committee to work with the University of Reading on a project called 'Linksphere'. Part of this will investigate how and why academics are using - or not using - web 2.0 technologies such as blogs, twitter, and facebook for academic purposes. "Little is known about the benefits - or drawbacks - of using these tools in the academic working environment, and Linksphere hopes to articulate how these tools are used, whilst advising on the construction of a web 2.0 environment for researchers at Reading. "One of the joys of maintaining a professional blog is you never know who is reading, or who will come across it, and comment. 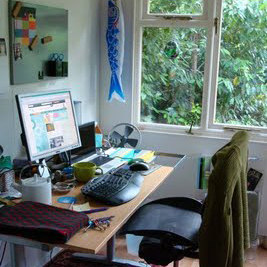 An entry on my blog about my home office - a standalone building at the bottom of my garden - led the BBC6 Radio breakfast show, hosted by Shaun Keveney, to contact me for an interview as part of a feature on people who work from sheds in their garden. It was a bit of fun - but a different type of outreach and publicity! "There must be others at UCL who maintain professional blogs. I'd be very interested to hear from them, about why and how they do it. Do get in touch, in whichever way you prefer…." UCL Communications would also be interested in hearing from UCL staff who maintain blogs or use other forms of social media. UCL Information Studies offers postgraduate qualification and training for all the information professions. It is the country's largest library school, and its teaching is built upon an international research reputation second to none. The department is host to the UCL Centre for Publishing and three research centres.